On the beautiful hills of the Val d’Orcia, not far from the Renaissant town of Pienza, this beautiful finely-restored stone farmhouse of 740 sqm is ideal for those looking for a residence with excellent privacy. The property offers a total of 8 bedrooms (in two apartments), an ample garage and a beautiful 22 x 4 m half-indoor pool. Alternatively, the size of the building would easily allow starting an accommodation business.ss. 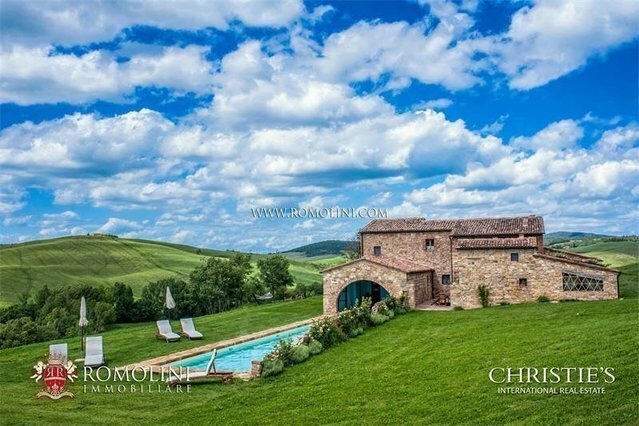 GEOGRAPHIC LOCATION On the hills of Val d'Orcia, just a few kilometers from the beautiful Pienza, a typical stone farmhouse, finely restored with an indoor pool and an ample garage. Located in an extremely quiet and private, surrounded by hills, the farmhouse allows you to reach all the services available in Pienza in a very short time (7km, 10’) but also to move throughout Tuscany, visiting the most beautiful and interesting: the wine towns of Montalcino (19km; 25’) and Montepulciano (20km; 25’), Torrita di Siena (22km; 30’), Castiglione del Lago on the Trasimeno Lake (47km; 1h), the unique medieval city of Siena (50km; 1h), the Etruscan village of Cortona (57km, 1h 5’), Arezzo (66km, 1h 10’), Grosseto (76km, 1h 15’), Orvieto (86km, 1h 25’), Greve in Chianti (93km; 50’), San Gimignano with its towers (96km, 1h 45’) and the Renaissance center of Florence (124km; 1h 50’). The most convenient airports to reach the property are Grosseto Baccarini (80km; 1h 20’), Perugia Sant’Egidio (100km; 1h 25’), Florence Peretola (141km; 1h 50’), Pisa Galilei (201km; 2h 30’), Rome Ciampino (207km; 2h 30’), Rome Fiumicino (222km; 2h 35’), Bologna Marconi (222km; 2h 40’), Milan Linate (418km; 4h 25’) and Milan Malpensa (472km; 5h). DESCRIPTION OF THE BUILDINGS The farmhouse (520 sqm – 5,595 sqft, 8 bedrooms and 8 bathrooms) is structured on two floors and divided into two independent apartments as follows: - Apartment N°1: living room, kitchen, three bedrooms with en-suite bathroom, bedroom and independent bathroom; - Apartment N°2: living room, kitchen, three bedrooms with en-suite bathroom, bedroom and independent bathroom. An ample garage (200 sqm – 2,152 sqft) allows sheltering multiple cars while a technical room (20 sqm – 215 sqft) hosts the pool systems. STATE AND FINISHES The farmhouse has been recently renovated with care in order to preserve all the typical features of this building in the Tuscan countryside. We can find the classic stone walls, wooden beams, original terracotta floors, wooden floors, a paved courtyard between the two wings of the building and barrel vaults in masonry. EXTERNAL The farmhouse is surrounded by 1.1 hectares of land. Immediately around the building there is a well-maintained garden while the 22 x 4 m swimming pool is partially covered inside the farmhouse. The irrigation system is linked to a well collecting rainwater from a pond and the eaves of the house. È possibile acquistare ulteriore terreno. USE AND POTENTIALITY The farmhouse, due to its large size, can easily be used as a private residence or as an accommodation with an indoor swimming pool and a yoga room. The splendid surrounding landscape and the quiet offered by the hills of the Val d’Orcia contribute to the receptive activity.